Floyd County Prosecutor Keith A. Henderson is a board member of the Association of Indiana Prosecuting Attorneys (AIPA) and the Indiana State Representative to the National District Attorneys Association (NDAA). 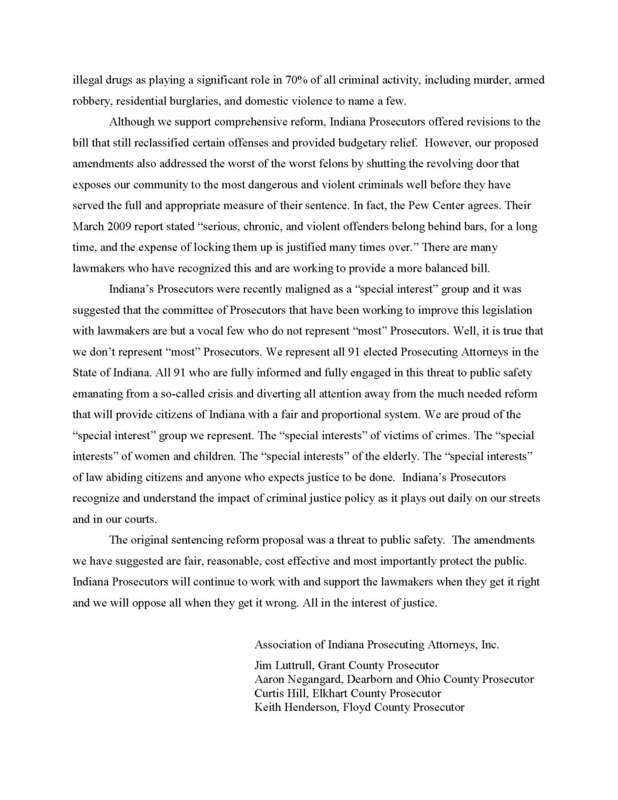 The AIPA represents all 91 county prosecutors in the State of Indiana and recently released an opinion piece in reference to pending legislation described in Senate Bill 561 (SB 561). The Association of Indiana Prosecuting Attorneys represents the interests of law abiding citizens and victims of crime in opposing SB 561. This pending legislation seeks to enact prisoner sentencing reform and a revision of Indiana Code that would allow violent criminal offenders reduced sentences while also hindering law enforcement’s ability to arrest and prosecute criminals involved in the trafficking and possession of illegal drugs. SB 561 presents a direct threat to public safety in the name of reduced state spending. 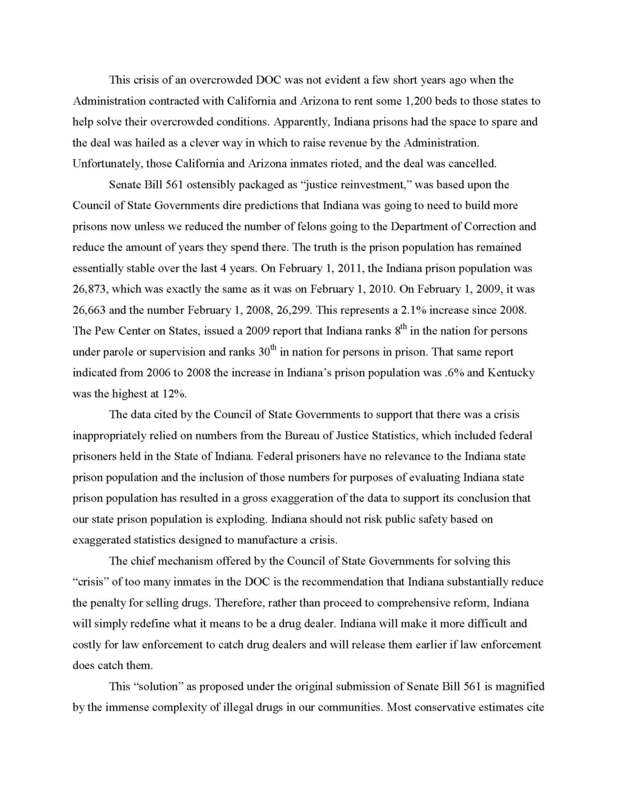 At issue is the belief that the Indiana Department of Corrections (IDOC) cannot support an overcrowded prison population during the current economic climate. Reports that have described IDOC prison overcrowding as a “crisis” have employed faulty data. The Association of Indiana Prosecuting Attorneys continues to cooperate with state government in supporting comprehensive criminal justice reform; however, SB 561 is without balance, endangers public safety, and seeks to remedy a “crisis” that does not exist. The 91 Indiana county prosecutors are directly engaged with the criminal justice system at every level through direct contact with law enforcement, victims, and the courts. By the nature of their service, county prosecutors acquire a holistic view of the criminal justice system; this unique perspective has been made available to state legislators through proposed amendments to SB 561 that are both fair and reasonable, cost effective, and protective of public safety. 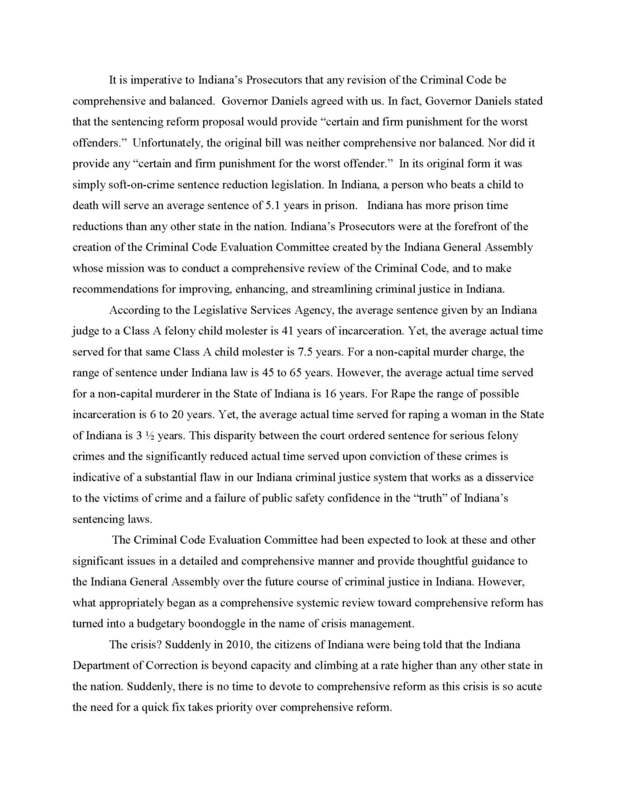 Members of the Association of Indiana Prosecuting Attorneys recently released the following position statement as part of continued efforts to achieve viable and comprehensive criminal justice reform for the benefit of the State and our local communities: Available in Adobe Portable Document Format here (AIPA Position Statement) or by clicking on the pages below.